This VHF course includes one full day of training and the VHF exam. The training will take place on Saturday with the exam taking place on Sunday. It is an important piece of safety equipment on board and this intensive one day course covers all aspects of using VHF including the most up-to-date changes of the Global Maritime Distress and Safety System. Radio simulators are used to teach and examine the course. The exam also includes a short written test. Training time for the RYA Short Range Certificate Course must be a minimum of 10 hours which may include up to 3 hours of guided self-learning. When you have booked your course you will be sent the accompanying SRC pack which includes the VHF Handbook G31 and exam application form. A list of topics that you must cover, using the VHF handbook, prior to attending the course will be included in your joining information. Please be aware, if you hold the ‘old’ VHF licence (pre-1999) you need to upgrade your qualification if you purchase new equipment. (please note that you must now register and pay this examination fee online with the RYA prior to attending your course. The RYA will then send you an exam report form with a barcode on it. This can then be completed by the assessor on the day of your actual exam). 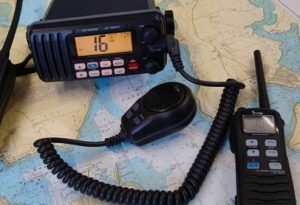 In addition to the course fee, there is an administration fee of £60 for the issue of the VHF radio licence, which is payable directly to the RYA. Please bring a cheque made payable to the Royal Yachting Association with you to the course. This course will give you the ability to be able to operate the radio and know the procedures required to use the radio.